“I feel now as if my feet are under the table,” said Phil Neville in August in the week leading up to the Wales match in Newport. Last week, as his side prepared for two friendlies against Brazil and Australia, Neville expanded on his added comfort in the role by going as far to say there is now an understanding between he and his players. “The biggest change was in the last camp where for the first time I think they got me,” he said. “It takes a while to get a philosophy across and after six or seven months I feel they understand what I want. 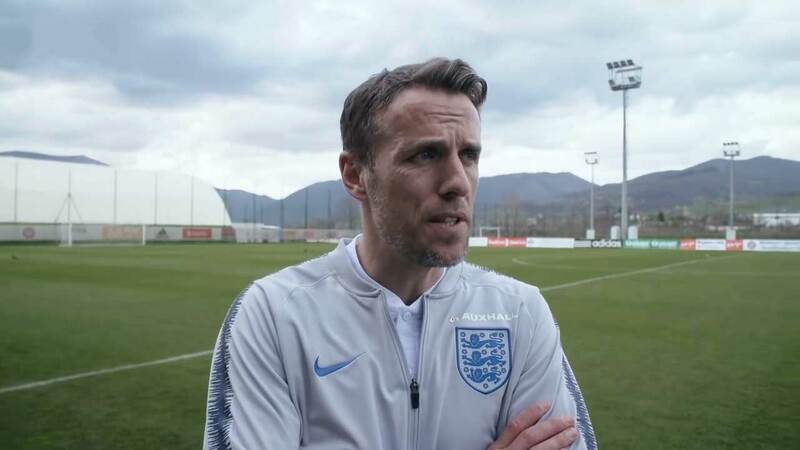 With added comfort comes a Neville more at ease with his own decisions and he’s talking like a man who now knows he has full control as well as the trust of his players, adding England would “die trying” and “live and die” by his style of play. It was a throwaway comment not too dissimilar to those thrown out by his predecessor but Neville’s new ruthlessness has to be backed up my results. A 1-0 win over Brazil on Saturday and subsequent 1-1 draw against Australia threw up familiar memories for England fans. A systematic failure to take chances when in a dominant position of authority didn’t cost England on Saturday but it did on Tuesday night when an equalizer less than ten minutes from time left Neville wondering what might have been and accepting his side needed to be more clinical. But Neville’s new found confidence in his role appears to extend to his thoughts on how he intends to filter in the young talent that is lining up for a senior call-up. Before the Wales match, Neville admitted to the media he wanted to bring in several of Mo Marley’s squad that had just returned from France with a bronze medal but was advised against it by his former temporary assistant due to the fatigue carried over from a tournament in which England played six games in a short space of time. More long-term thinking is understandable and Neville appears to be taking a much more sensible view when it comes to when to promote a group of players still recovering from a grueling World Cup, but it’s a certainly a change in rhetoric from what the head coach had to say pre-Wales in August. On Chamberlain, he added, “Siobhan was on standby because of her experience and because she’s had a good start to the season with Manchester United. I think people forget Liverpool didn’t have a goalkeeper coach last year, her form suffered for that. We know what we’re getting with Shiv. If we go to a World Cup and our first two goalkeepers are injured or not in form I’m going to need an experienced goalkeeper. With plenty of games to come it does appear Neville intends on trying to bed in some of the emerging talent in the coming camps but he now finds himself in a Catch-22 situation between bringing in his young stars of the future and preparing his regular squad of 23 for next summer’s showpiece event. Mark Sampson very much favored a staunch approach to regularly selecting unchanged squads in order to prepare for tournaments and went as far as naming his Euro 2017 squad three months before the tournament started in order to get the players ready for the challenge. Neville will now be thinking along similar lines and it showed in his squad selection for the two friendlies just passed but with Sweden next month, along with a possible trip to Austria, followed by a January camp and SheBelieves, one wonders just if and when will be the right time to bring in those young players, but the head coach now admits this camp wasn’t the right time for it. Neville went on to add, “People ask why are they not being given a chance too now but they need to keep their feet on the ground. Me, Mo, and Bev [Priestman] spoke to 40 young players in the Under-21 pathway, told them exactly where they stood and told them they could be going to a World Cup, an Olympics, and their home Euros. Neville also drew on his own experiences of playing for Manchester United as a graduate of their successful youth team and how Sir Alex Ferguson protected him from certain scenarios he wasn’t ready for as a youngster. “I was always looked after,” he said. “When I was a youngster I never played at Stamford Bridge because the boss wanted to protect me. Lauren needs to settle, Georgia needs to recover from the World Cup, Sandy needs to get her A-Levels, that’s more important than football.